In terms of its appearance, Frederic Gmeiner’s Table Recorder is slightly remindful of Laurie Anderson’s wonderful Handphone Table. But, while Anderson’s installation merely functions as a poetic playback device for pre-produced music, this table allows you to actually create your own sounds. 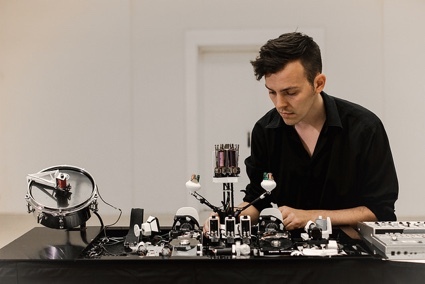 After having built a mechanically actuated musical alarm clock as a prototype for this project, his aim was to “create a playful object which may be completely integrated into everyday life”. 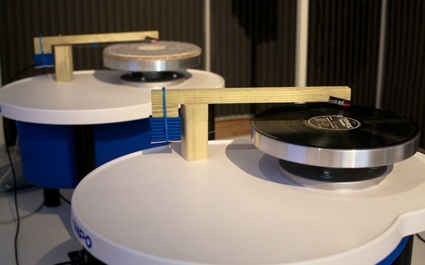 Besides being a real, usable table, it will echo movements with sound. Below the surface, pressure-sensors feel a user’s touch and actuate custom-built solenoids which inside the drawers then bang on arbitrary objects, at the time including a glass, a plate, a xylophone and a saw. In one mode, the table acts as a simple sequencer which will loop the recorded sounds in two-second intervals. 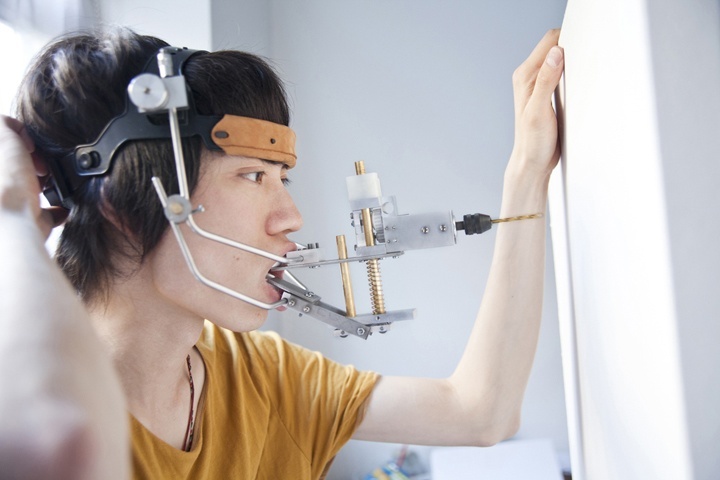 In the other mode however, it will record movements and play them back with a delay of half an hour. When it is actually being used as a table, it might thus resonate its use, for example to someone who is just coming home. To erase what has been recorded, you simply – wipe it. What really impressed me during Frederic’s demonstration though, was when he lifted the tabletop to adjust the sensors with a screwdriver – it suddenly looked as if he was tuning a piano. Another fun piece from the same course (Kora Kimpel and Dennis Paul‘s introductory course to the digital media class at UDK) was Julius von Bismarck’s still unnamed but camera-equipped blimp, which allows you to see yourself from above when you put on the accompanying space-age helmet that contains tiny screens. When asked about the idea behind this piece, he told me that he likes the top-down perspective of the original Grand Theft Auto-games and that he just wanted to try that out in everyday life. It really did look like GTA in the same weird augmented-reality way as U-Tsu-Shi-O-Mi at SIGGRAPH. Too bad we couldn’t take it outside to hijack a couple of cars. More projects included a moving golf-hole, an enhanced version of tic-tac-toe called Cmatch and another beautiful board game. Posted in design, installation, udk. Bookmark the permalink.